1. Place large rimmed baking pan in oven; preheat oven to 475°. 2. In large bowl, toss garlic, cauliflower, oil, 1-1/2 teaspoons chipotle pepper, and 1/2 teaspoon each salt and pepper. Spread in single layer on hot pan; roast 15 minutes or until charred, turning once during last 2 minutes of cooking. 3. In medium bowl, toss tomato, beans, cilantro, lime juice, and remaining 1/4 teaspoon chipotle powder, and 1/8 teaspoon each salt and pepper; fold in avocado. 4. 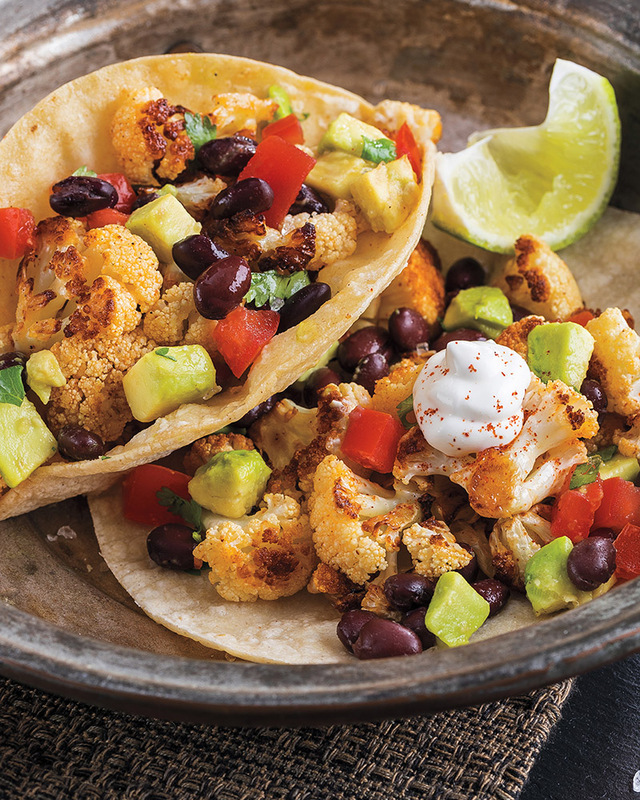 Evenly fill tortillas with cauliflower mixture and avocado mixture; evenly top with sour cream. To crisp tortillas, spray 1 side with cooking spray, then hang tortillas sprayed side down, over 1 rung of the oven rack. Bake at 275° for 10 minutes or until crisp. > This is the perfect meal to celebrate Meatless Monday! For some extra family fun – try swapping white cauliflower for purple, orange and green varieties. Don’t like black beans? Swap for chickpeas and roast on the same pan as the cauliflower.